The Pew Hispanic Center, a project of the Pew Research Center, today released statistical profiles of the Latino eligible voter populations in 27 states. Derived from the 2008 American Community Survey, these profiles provide key demographic and socioeconomic information about Latino eligible voters and all eligible voters (U.S. citizens ages 18 and older). They also contain Latino population estimates for congressional districts in the 27 states. The Center also launched a new feature on its website called Mapping the Latino Electorate. This interactive feature provides key eligible voter statistics in the nation’s 50 states and the District of Columbia along with Hispanic population estimates in 435 congressional districts. 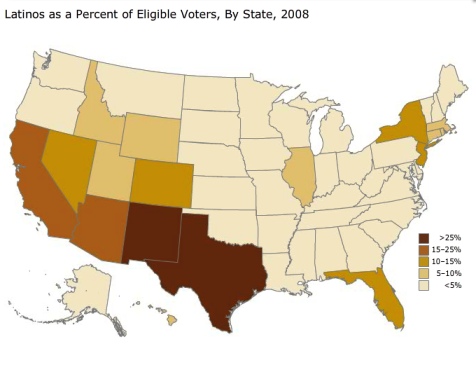 Find both the statistical profiles of eligible voters and the Mapping the Latino Electorate feature at pewhispanic.org.